“And I, if I be lifted up from the earth, will draw all men unto me.” John 12:32 KJV This Beautiful Cross symbol of Christs Victory over sin and death and ours is from St Demetrios Church in Seattle see below for more information. Image OrthodoxNorthwest. Our first and greatest pilgrimage site is our neighbor. Those surrounding us. Which we often fail to treat as we should wish to be treated. Κύριε ἐλέησον, Κύριε ἐλέησον,Κύριε ἐλέησον. Despite the above, in the struggle of life we need to be uplifted, inspired and renewed. Sometimes we simply need a change of scenery. And so we have places of pilgrimage. Russian Pilgrim with Lestovka лѣстовка, (old Russian leather prayer rope). Image found on several sites on the web. Unk Original. While we do not have nearly the number of opportunities of pilgrimage that Orthodox Christians have in the “old countries.” We do have some historic, beautiful and Holy sites well worth visiting. The first site listed is the oldest Church in the NW and a Church all Orthodox can call their own equally. I have included St Spiridons next as it also is a very old historic founding parish. Both of these parishes were established when all Orthodox looked to the same Bishop as their own. * Both of these parishes have similar history and could argue over who is the oldest. The other sites will be listed in alphabetical order so as not to appear biased. This site is a work in progress beware of falling debris. Blessed art Thou, O Christ our God, Who has revealed the fishermen as most wise. Historic Holy Trinity in Wilkeson, Washington the “Mother Church” in the NW. This Church is the oldest Orthodox Church building in the NW and had a multi ethnic start. Established 1900. This Church celebrates its Feast on Pentecost. This Church is truly a home for all Orthodox Christians in the Northwest. Holy Trinity Wilkeson, WA. This parish was visited and partially founded by Archimandrite Sebastian Dabovich. “In 1900 Saint Tikhon preached a sermon in which he described our first parishioners as “Arabs, Greeks and Slavs,” together with “Uniates [Byzantine Rite Catholics] who had reunited and were living in Wilkeson.” “(from the OCA website) A more complete history of the parish can be found here on the OCA website. If your going there “watch for the cupola in the small neighborhood to your left as you enter Wilkeson. Wilkeson is located five miles south of Buckley, via State Rt 165. Buckley lies between Bonney Lake and Enumclaw on Highway 410.”(OCA website) Pentecost is the Parish Feast and generally the Feast is served there. Wouldn’t it be wonderful if Orthodox from around the area would make a pilgrimage there for Pentecost and serve together?! Bright Monday Liturgy 2012 AD, from the OCA Website. “Holy Trinity Church is listed on both national and state historical registers. It continues to serve the community on special occasions and feast days, as regular services are now held at the larger Holy Resurrection Church. Founded in 1896, the parish ministered to the coal mining community in the Cascade Mountain foothills of southeast Pierce County, approximately 45 miles southeast of Seattle. Built in 1900, Holy Trinity Church was consecrated in 1902 by Bishop Saint TIkhon [Belavin] of the Aleutians and North America, who later returned to Russia where in 1917 he was elected Patriarch of Moscow. In 1925, he died as a confessor of the faith, a victim of the Soviet government’s anti-Church policies. To assist in financing the restoration and maintenance of historic Holy Trinity Church, post cards depicting the church in 2011 and the 1910-20 era and icon cards of Saint Tikhon are available at $1.00 each. Please send check or money order to Holy Resurrection Church, PO Box 1332, Puyallup, WA 98371. St Spiridon’s Cathedral is one of the oldest Orthodox Church Congregations in the US. It’s original building has not survived. But the congregation has. It is truly a multiethnic, and historic congregation to this day. I have included a few quotes from the Parish history on their website. It is truly an interesting history and well worth a visit and a read. “In the late 1800’s, composed overwhelmingly of young men in their mid-twenties, many of whom were emigrants from Greece, Russia, Serbia and the Near East, mostly loggers, fishermen, cooks and waiters, Saint Spiridon’s Cathedral was the heir to both the longing for the faith and culture of the members’ countries of origin and an amazing missionary strategy on the part of Russian churchmen half a world away. Since a large proportion of the congregation spoke Greek as their native language, the Russian mission saw to it that most of the early rectors were proficient in that language as well as Russian and English. One of the resources open to the Russian Church was the number of priests who came from Greek-Russian families in the Crimea. St Spiridon’s Cathedral Orthodox Church in America photo by OrthodoxNorthwest. St Spiridon’s Cathedral as seen from a public telescope on the Space Needle, Seattle, WA photo property of OrthodoxNorthwest. All Merciful Saviour Monastery bathed in a Gentle Light. Photo from the website, please click to learn more or support the Monastery. “The Brotherhood of the All-Merciful Saviour was established in 1986 by Archimandrite Dimitry (Egoroff) of blessed memory. The Monastery is under the omophore of The Rt. Rev. Bishop Theodosy of Seattle, of the Russian Orthodox Church Outside of Russia. The Very Rev. Igumen Tryphon is the abbot of the monastery.” More information can be found on their website or for daily inspiration The Morning Offering mentioned above. The above is an excerpt from a new CD the Brotherhood is working on. British Columbia is Blessed with a Monastery that is well known for its outreach to all ethnic groups. I hope to get more photos in the future. All Saints Of North America Monastery Dewdney.BC. Photo from OCA Diocese of Canada. Click to go to webpage. All Saints of North America Monastery Church Photo courtesy of the Monastery. Thank you! All Saints of North America Monastery Church Photo courtesy of the Monastery lit at night Thank you! Liturgy at the Monastery of All Saints of North America Monastery Church Photo courtesy of the Monastery. Thank you! The Sunday of All Saints of North America and The Theotokos “Joy of Canada” – Is On Second Sunday of August. This small Byzantine revival structure building is over 100 years old. The interior Apse is lovely from photos and captures the look of many Churches of this time period. It was reconsecrated in…. Definitely a small Church I would like to stop in my travels in southern Idaho. In giving birth thou didst preserve thy virginity; in thy dormition thou didst not forsake the world, O Theotokos. Thou wast translated unto life, since thou art the Mother of Life, and by thine intercessions doest thou deliver our souls from death. Interior of the Assumption Blessed Virgin Mary Greek Orthodox Church Pocatello, Idaho. fb page click to connect. One thing have I desired of the LORD, that will I seek after; that I may dwell in the house of the LORD all the days of my life, to behold the beauty of the LORD, and to enquire in his temple. Psalm 27:4 KJV The Beautiful Altar and Apse of Assumption of the Blessed Virgin Mary in Pocatello, Idaho. fb page click for more photos of the Church. The church and its intact interior provide an excellent example of Byzantine Revival architecture and since its con­struction in 1915 has served as the educational, religious, and social focal point of the immigrant Greek community in Pocatello…. Upcoming exhibits from Dec 2017 newsletter! Click to learn more! This small but informative museum is dedicated to the Greek history in the NW. It is located on the grounds of Holy Trinity Cathedral in Portland. the earliest immigrants and continuing into the future. Holy Trinity Greek Orthodox Cathedral Portland, Oregon. This photo is courtesy of Sabrina Messenger, former resident of the great NW. Thank you! Holy Trinity Greek Orthodox Cathedral Portland, Oregon. View from the narthex into the nave. This photo is courtesy of Sabrina Messenger, former resident of the great NW. Thank you! This parish per the website was built between 1938-1940. Decorated for Pentecost the Parish Feast Day! 2017? Photo from parish fb page please click for more! This is the oldest Parish in Montana and for many years was the only parish in Montana. This Church sits prominently on a hill and is landmark. It is frescoed from top to bottom which has an even bigger impact being in such an isolated area, from other Orthodox. The Church is active in supporting missions in Montana. Hopefully history to follow. Holy Trinity Serbian Orthodox Church in Butte Montana built 1965. The original church was built in 105. For years the only Orthodox parish in Montana. Photo from Church website click for more information. “Our vibrant Orthodox community has members with various ethnic backgrounds, Serbian, Greek, Irish, Scottish, German, etc. Holy Trinity parish is pan-Orthodox and welcomes everyone seeking the fullness of the Christian faith revealed by Jesus Christ, confirmed by Holy Scripture, preached by the Apostles, and lived victoriously throughout the centuries by countless holy women, men, and children. Click here for a 360 view of the Iconography! Interior of Holy Trinity Serbian Orthodox Church, Butte Montana. Photo from their website click to see a 360 panorama. ¨One of the most dramatic elements of the exhibition is the actual-size digital photograph of the Shroud, printed on linen, and mounted in a similar fashion in which the Shroud has been displayed to pilgrims during its recent showings in Turin. This reproduction lends itself well to being placed in a setting which is conducive to prayer as well as observation. The exhibit will be of special interest to those asking questions about Christian faith, as it focuses in bringing participants to ask the question, “Who is the Man of the Shroud?” Confronting us with the evidence of Jesus’ sufferings and death – as well as His Resurrection – the Shroud causes us to ask the further question, “And what does He mean to me?” excerpt from the Website click to learn more or to book an exhibition! Maryhill Museum is included because of the Exhibit dedicated to Marie Queen of Romania, who visited the Museum in 1926. This includes a throne, gowns, crown etc… They also have an Icon collection which she also donated to the museum. The collections are not large, but the drive, the view and the architecture make for a memorable visit. Also Stonehenge is nearby. And of course one can grab some Baklava and Greek coffee from the nuns coffeeshop in Goldendale, and attend hopefully Vespers at the end of the day. A truly beautiful prayer service with the nuns. The Old Believers “(Russian: старове́ры or старообря́дцы-per Orthodoxwiki) sometimes called Old Ritualists were a split during the time of Patriarch Nikon of Moscow in 1666-1667. The history is a fascinating and sad account of a schism that probably was very avoidable. As in any split there were mistakes and failings on both sides. But the government and official Church did persecute the Old Believers for simply maintaining Russian Orthodox traditions. Thankfully today the anathemas have been lifted, and relations are much better than probably any time in the past. My point is not to point out sins and failings but to emphasize our mutual faith in the One saving Lord. The Old believers did not have any Bishops join their resistance and became Priestless for many years. It is only in the last century or so that they have “regained an espicopate” from Bishops that were once part of the Orthodox Church. The Old Believers do not wish to be bothered, and prefer to live apart to maintain their traditions. But if you are in the area the Churches are of interest. Regarding attending services I am not sure how it would work. But like a non Orthodox on Athos you would not be allowed in the nave and only the narthex at best is my understanding. For those interested in learning more I will include some links. Another interesting fact is that there are Old Believer Parishes in full communion with the Russian Orthodox Church and Erie, PA has a parish that joined ROCOR years ago. I was hoping to include a museum to the Old Believers that was started by a Benedictine Monk at Mt Angels, Abbey and Seminary in Oregon in this section. But it appears to no longer exist at the Abbey although they have a museum there of other items, art, Liturgical and non and natural history. This monk was very sympathetic to the Old Believers and assisted them. And there was a Catholic outreach to them. The museum was small, quaint, and worth a visit for its unique subject and the lovely surroundings. It was quite harsh in its judgement of the Russian Church. I have included a link with a virtual tour. If I can find out more I will include it. Church of the Nativity Erie, PA is an excellent starting point for history on the Old Rite. Old Believer church near Gervais, Oregon. — Andrew Parodi 06:26, 1 May 2007 from wikipedia. Stichos 1: Let God arise and let His enemies be scattered, and let them that hate Him flee from before His face. Christ is risen from the dead, trampling down death by death, and upon those in the tombs bestowing life. Stichos 2: As smoke vanisheth, so let them vanish, as wax melteth before the fire. Christ is risen from the dead, trampling down death by death. And upon those in the tombs bestowing life. Stichos 3: So let the sinners perish at the presence of God, and let the righteous be glad. Christ is risen from the dead, trampling down death by death. And upon those in the tombs bestowing life. Stichos 4: This is the day which the Lord hath made; let us rejoice and be glad therein. Christ is risen from the dead, trampling down death by death. And upon those in the tombs bestowing life. Glory to the Father and to the Son and to the Holy Spirit. Christ is risen from the dead, trampling down death by death. And upon those in the tombs bestowing life. Both now and ever, and unto the ages of ages. Amen. Christ is risen from the dead, trampling down death by death. And upon those in the tombs bestowing life. Holy Resurrection Russian Orthodox Sobor Church, Vancouver, British Columbia. Photo from Archdiocese of Canada Orthodox Church in America. Click for more information. This is I believe the oldest Orthodox Congregation in British Columbia. The Congregation served the first Liturgy on Sept 24, 1924 in a YMCA hall. Per the OCA website. Holy Resurrection Russian Orthodox Sobor, Vancouver, British Columbia Patronal Feast 2003. From their website. Click for more info and photos! St Demetrios is included as it was the first Greek Parish in Seattle that was once part of St Spiridon’s above. Its initial founding was not seen as a split but as a cause of rejoicing that the Orthodox could have another parish in Seattle and the Greeks a place to fully celebrate according to their traditions. Today St Demetrios is a beautiful and active parish, very involved in charity, missions and outreach besides its well known and appreciated Greek Festival. “We welcome all resident and non-resident Orthodox and non-Orthodox faithful to our church and invite you to join us for altar services, educational programs and events. “To proclaim the Gospel of Christ in the Orthodox Christian Tradition while creating a vibrant, loving, compassionate and supportive community. The Original St Demetrios Church taken soon after it was built in 1921. Today the site is just off of I-5 and is the location of the large flagship store of R.E.I. St Demetrios the Great Martyr on the Icon Screen at St Demetrios Parish. Photo OrthodoxNorthest. Verily, the inhabited world found thee a great succor in tribulations and a vanquisher of nations, O fight-bearing one. Wherefore, as thou didst demolish the arrogance of Lahosh, and on the battle-field didst hearten Nestor, beseech, O Saint, Christ God to grant us the Great Mercy. Lo, Thy care for thy flock in its sojourn prefigured the supplication which thou dost ever offer up for the whole world. Thus do we believe, having come to know thy love, O holy hierarch and wonderworker John. Wholly sanctified by God through the ministry of the all-pure Mysteries and thyself ever strengthened thereby, thou didst hasten to the suffering, O most gladsome healer, hasten now also to the aid of us who honor thee with all our heart. St John of San Francisco, Shanghai and Seattle. This Icon does contain a relic. Photo OrthodoxNorthwest. Tucked away in the center of the state is the well known and loved Monastery of St John the Forerunner. It is definitely not in an area where you would expect a Greek Orthodox Monastery. St John the Forerunner Monastery Church interior. From their website used with permission. Click to go to website. “Saint Nicholas Cathedral is one of the oldest parishes of the Russian Orthodox Church Outside of Russia in the United States. 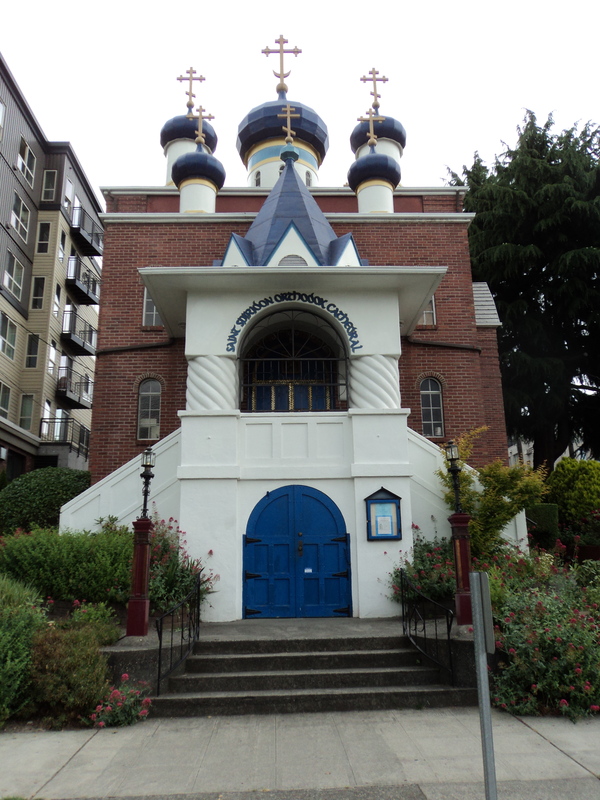 The St. Nicholas Russian Orthodox Greek Catholic Church, as it was then called, was founded in 1932 by Russian immigrants, many of whom were naval officers under the tsar, who fled the scourge of Bolshevism. With the blessing of His Eminence Archbishop Tikhon of San Francisco and Western American, they formed a Russian Orthodox community, bought land and built a church. St Nicholas Cathedral decorated for Pascha 2017. From their FB page please click on it to see more! The community was first served by visiting priests from San Francisco and Los Angeles and later by the first rector Very Reverend Archpriest Michael Nikolaevsky. After the untimely death of Fr. Michael, the Very Reverend Archpriest Michael Danilchik was appointed as rector. It was during the tenure of Fr. Michael Danilchik that the church was built. The chair and room St John reposed in the Lord, July 2nd 1966 AD Gregorian. This room is now a converted chapel. Photo found on Internet. Holy Father Nicholas pray for us! Icon of St Nicholas at St Nicholas Cathedral Russian Orthodox Church Outside of Russia, Seattle. Photo property of OrthodoxNorthwest. Transfiguration 2017 St Nicholas Cathedral with Bishop Theodosius Blessing. St Nicholas FB page. Please click to see more of this Parish. 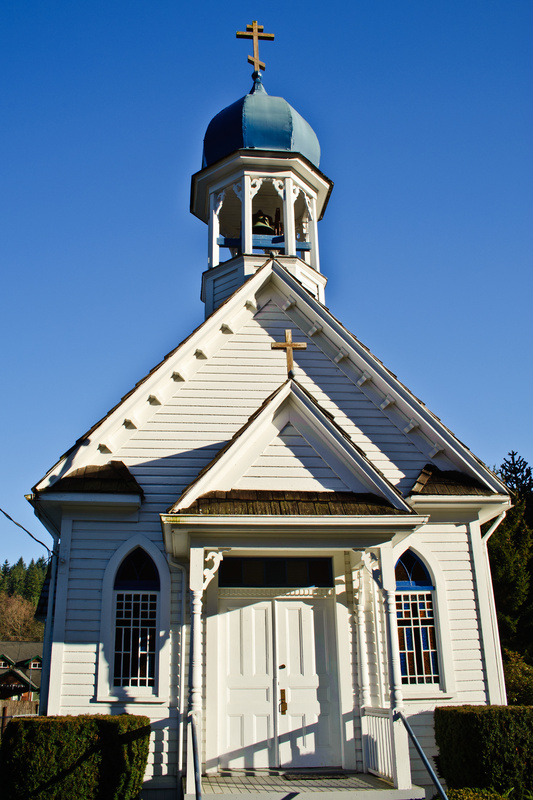 St Nicholas is the first parish in Oregon and was originally multiethnic. It is a an active and multiethnic parish to this day. Reaching out to all with the Orthodox Faith and the salvation found in our Lord. St Nicholas Orthodox Church with parishioners 1959. This was the old building on NE Mallory St., Portland, Oregon. Photo from Parish fb page click to see more and connect with the parish. St Peter’s Monastery is not yet a functioning monastery but the grounds have been blessed and the foundations laid. They also feature summer work parties a great chance for youth and adults to do something inspirational in the summer! I am aware of the confusing and complicated history of Orthodoxy in the US. But it does seem to be a general truism that a many Orthodox did recognize the Russian Orthodox’s Church sovereignity over the US. In the NW based on early history of which I do not claim to be an expert, it appears the varied Orthodox nationalities was aware of and looked to the Russian Bishop for some type of leadership. It is the hope of this editor that we can all once again look to one Bishop, which will shine forth our Faith regardless of our ethnic identity.